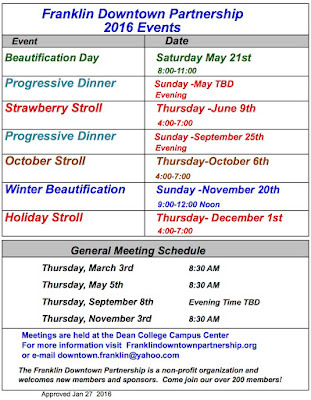 The Franklin Downtown Partnership has set its 2016 dates for the Strawberry Stroll, October Stroll, Holiday Stroll, Spring and Winter Beautification days, and a Progressive Dinner. The Partnership also announces its General Meeting dates and Spring Networking Luncheons, all open to the public. Downtown Beautification Day will be Saturday, May 21, 8:00 -- 11 a.m. The Partnership, the Franklin Garden Club and enthusiastic volunteers will install hundreds of flowers and greens throughout downtown and on the Common. Community service hours will be available to students. Contact Eileen Mason, emason4234@gmail.com, for more information about the event, volunteer and sponsorship opportunities. Winter Beautification Day will be Sunday, November 20. The 13th annual Strawberry Stroll will happen Thursday, June 9, from 4:00 – 7:00 p.m. Celebrate warmer weather with the Partnership’s famously delicious Strawberry Shortcakes, enjoy live entertainment and shop a sidewalk sale. If you would like to sponsor this event please contact event Co-chair Nicole Fortier, nfortier@deanbank.com. The October Stroll is set for Thursday, October 6, from 4:00 – 7:00 p.m. Pumpkin giveaways, games, delicious food, fall crafts, and live local entertainment will draw people downtown for a great evening with their neighbors. Beth Simon and Scott Martin will co-chair this popular new event. The festive Holiday Stroll will be Thursday, December 1, 4:00 – 7:00 p.m. This family favorite holiday celebration will include a tree lighting ceremony, visits from Santa, his elves and Mrs. Claus, gift shopping, holiday crafts for kids, live entertainment, and food and drink specials. Roberta Trahan and Jim Schultz will co-chair this event. A Progressive Dinner is being planned for a Sunday evening in May (date to be decided). Celebrate Franklin’s restaurant and entertainment options with old and new friends. Menus and ticket information will be available on the FDP website and social media closer to the event date. To learn more or be involved in the event please contact Jane Curren at janeframe@verizon.net. All FDP events and beautification efforts are possible thanks to business and resident memberships, donations and sponsorships. Franklin residents can join the Partnership for $25, and business memberships start as low as $100. Membership dues and donations are tax deductible. The Partnership invites business owners, organization leaders and all interested residents to come learn more about issues affecting downtown Franklin at its General Meetings on May 5, September 8 and November 3. The May and November meetings will be held at 8:30 a.m., and the September meeting will be in the evening; all meetings are held at the Dean College Campus Center. Make connections, share business ideas and develop partnerships at the FDP Networking Luncheons. The next lunch is scheduled for April 15. All luncheons take place on Fridays at 1:00 p.m. in the Smith Dining Center at Dean College. Matt Lechter, mlechter@dean.edu, and Gary Donelan, gary.donelan@middlesexbank.com, co-chair the networking efforts. 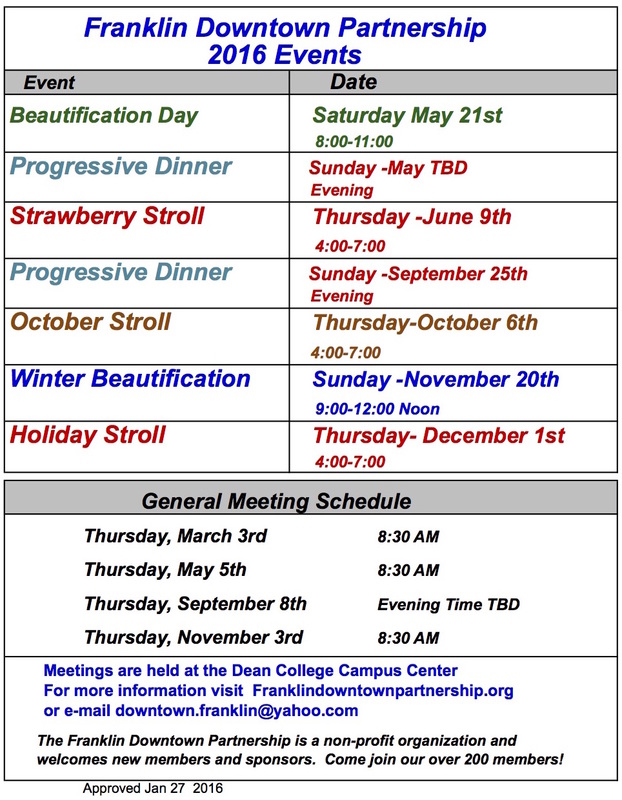 More information about each event, meeting, sponsorship, membership and volunteer opportunities can be found at www.franklindowntownpartnership.org, on Facebook at www.facebook.com/FranklinDowntownPartnership.org or on Twitter at @FranklinDowntwn. The Franklin Downtown Partnership is a nonprofit, 501©3 organization made up of business owners, community leaders and residents working to stimulate economic development downtown and create a positive impact throughout the area. The FDP currently has over 200 members and welcomes all businesses and residents. For more information, please contact Executive Director Lisa Piana at downtown.franklin@yahoo.com.